I tested these new versatile on-ear Flux headphones with inline microphone against four different under-$200 on-ear competitors. Each of the two more expensive headsets has slightly superior music playback audio than does Flux, but both of them are far less comfortable than Flux. The sonic music experience with Flux is essentially identical to the two headsets in its immediate price category of roughly $100. One of the other two has a much worse fit than does Flux, and the final competitor has a similar fit but is not as full-featured as Flux. Jump to the head of the class, Flux by SteelSeries! 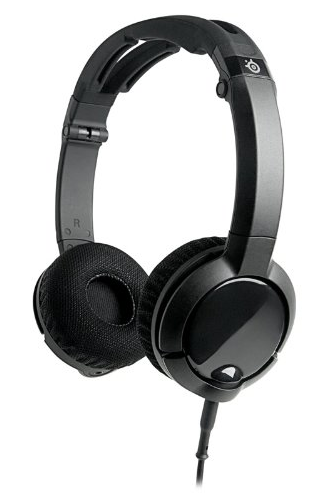 Its audio cable can be attached to either right or left earpiece, and either earpiece can serve as an audio source for connected slave headphones. Flux’s microphone is among the very best ever for FaceTime or similar spoken conversations. Flux can potentially be used in an amateur DJ environment, because the earpieces can easily be rotated. The earpieces fold flat and inward for low-profile storage and travel, although no case is provided, which is a disappointment. Earpiece cover accessories are available for purchase from the company when a custom color look is desired or required. Construction, fit, and comfort are very good, even when wearing eyeglasses or a baseball cap. Protect your Flux from the elements and your pets and friends and these headphones will provide a top-notch musical and vocal experience for years. I keep mine in a small zippered bag, and a Ziploc clear bag will also suffice. Bass is prominent, especially upon initial listening. Play your Flux for up to ten hours at medium volume in your sock drawer using an old iPad that is collecting dust on your shelf, in order to condition the speaker drivers for optimal output. Then listen to a range of musical styles with some different equalizer (EQ) settings to determine your preferred sound profile. The more you listen with Flux the better they sound and the more you want to listen using them. For $100 or less you can’t expect a full audiophile experience, but it’s still a darn good one. There are gaps in the sonic spectrum that are forgiven with Flux’s rich bass and crisp midrange and treble. Ambient room noise passive isolation is typical for on-ear snug headphones with no active sound reduction feature. Be careful, please, when playing Flux and other headphones at high volume, because they can be very loud and dangerous to your hearing. Have you ever listened to Tonight I’ll Be Staying Here With You by Bob Dylan from the Live 1975 Rolling Thunder Review? It’s a wowzer, with new lyrics, rocking beat, and chromatic bridge into, heard with Flux’s immersive experience. You are immediately thrust into the center of the song, instead of thinking that your headphones sound really good. Listen to The Fields of Athenry from Rambling Boy by Charlie Haden Family & Friends, with remarkable arrangement, piano and guitar solos, and vocal performance by Petra Haden. The musician St. Vincent has a song called Paris Is Burning that will have you in awe of her artistry, thanks to Flux. Billy Ocean’s Get Outta My Dreams just started playing on my MOG Internet radio. Whoa, baby! These four and dozens more test tracks were used to evaluate Flux, and these headphones passed every test. I repeat: the more I listen with them, the more I want to listen. Nicely done, SteelSeries. Give us a carrying case and you get a a perfect score.